Aric Rogers, a scientist at MDI Biological Laboratory, and his colleagues have discovered mechanisms by which aging is slowed by restricting certain nutrients in our diet. 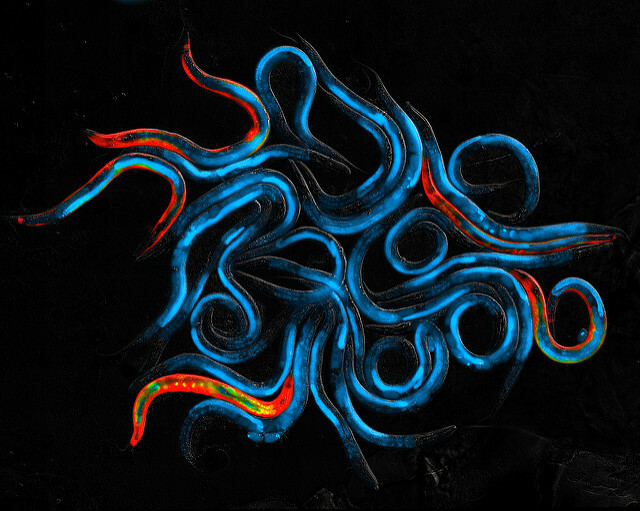 Using a tiny roundworm known as C. elegans that shares half of its genes with humans, MDI Biological Laboratory researchers found life-prolonging effects from certain dietary restrictions. Diets can prolong health and lifespan, but scientists haven’t known why until now, when researchers at MDI Biological Laboratory discovered a genetic pathway that explains the process. The hope is that one day it may lead to therapies that could extend our healthy years without requiring severe dietary restrictions. 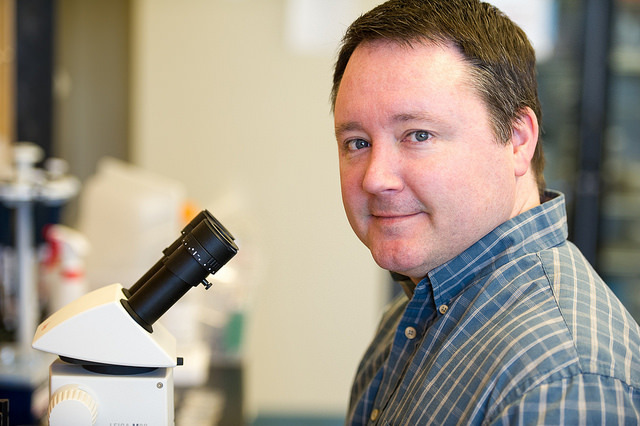 “Most diseases are age-related, so this is a way of avoiding almost all diseases,” MDIBL scientist Aric Rogers told Mainebiz in an interview this morning. He published a paper on the discovery with colleagues in the journal Aging Cell. MDIBL, based in Bar Harbor, is known worldwide for its research on aging, having held an international symposium last summer that Mainebiz wrote about in an article about the potential of living to age 150. The Aging Cell paper reveals how regulating the creation of proteins in the body is essential during our early development and later in life in our response to stresses in our environment both inside and outside of the body. Stresses cause excess protein to be created, which in turn could degrade the ability of our cells to function properly, thus stimulating aging or disease. “We know now how the genetic pathway that responds to nutrients gets activated and signals to other process, like protein synthesis,” he added. “Restricting the creation of new proteins is part of our ability to withstand great stress.” He said potential new drugs could target the activity of the pathway itself or modulate other behaviors in the body. Rogers studied a tiny roundworm called C.elegans, used frequently in research because it shares about half of its genes and lives only two to three weeks, allowing scientists to study many generations of the worms over a short timespan. They specifically looked at the large dietary components like proteins, carbohydrates and fats and what changes of those do to the body. The researchers noted that the life-prolonging effects of dietary restrictions occur in just about every animal tested. They think that is so because of evolution and animals having to adapt to harsh environments, such as when there isn’t enough food to eat. The new research builds on Rogers’ earlier research on dietary restrictions and their impact on the formation of proteins. With a lack of food, for example, the body decreases the amount of proteins it synthesizes for growth and reproduction. It then redirects energy in cells toward proteins that respond to the stress and help extend lifespan. The scientists noted that their discovery of the mechanism that underlies the protective effect of dietary restriction may some day lead to therapies for age-related diseases, including Alzheimer’s and Parkinson’s that are associated with less quality control within cells. “We think therapies to active these protective pathways could not only prolong lifespan, but also delay the onset of age-related diseases,” Rogers said. The research was supported by grants from the National Institute on Aging of the National Institutes of Health, The Ellison Medical Foundation and an Institutional Development Award from the National Institute of General Medical Sciences of the NIH.